Mom FINALLY added me as a contributor. And she calls me lazy! I’m not lazy, I’m a cat. What’s her excuse? Don’t get me wrong: I love Mom. I love her a lot! But sometimes I have to tell her about a hundred times that I ate some of my food and I want her to fill the bowl back up to the top. And sometimes I have to pretend I think Charlie’s (he doesn’t want me to call him Dad) sawdust pile is a litterbox before Mom will clean my real one. Yuck! Before I forget: Mom wants me to remind you that this is the first of the month, so she has a new Hot Flash on the Hot Flashes page. So go read that and then come back here. 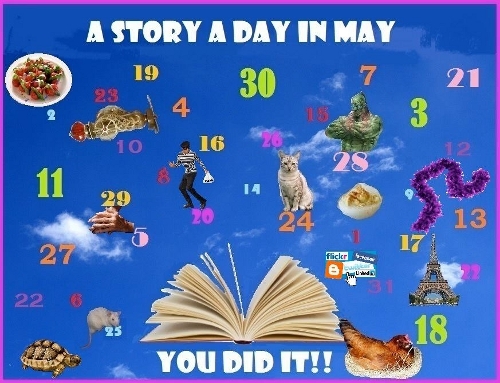 Mom just finished the Story A Day in May challenge. Her friend Andrea Gilbey from way over in England made her the badge at the top of this post. See the cat, just about right in the center, where cats ought to be? Andrea has pet rats, and sometimes I worry that Mom will shave my tail so she can be more like Miss Andrea! I liked it that Mom still made it be Caturday on Saturdays by posting stories about cats. She also made friends with two terrific cat bloggers, Mr. Nikita and Elvira Mistress of Felinity. I think it was because their Daddy Kiril lets them have their own blog that made her realize I ought to do Caturday at least SOME of the time! Mom says if I write any more, people will get tired and stop reading. Get tired? Of a cat? I think not. But I’m getting bored, so I’m going to go do something else. Bye-ee! PROMPT FOR CATS: Write about when you first found out some cats don’t have a forever home. This entry was posted in Caturday. Tagged cat blogger. Congrats to your Mama for her epic achievement in May. Yes, that story a day thing. I agree. It sure kept her busy, didn’t it? Now (obviously) more time for Katya!!!! I hope Mom uses her time giving me pets and head-scritches, not trying to get me to play with that dumb twinkling bouncy ball. I tore it up when the family was over for Memorial Day because I thought she would blame it on the kids (she never gets mad at kids). But she found the parts and fixed it. I shouldn’t have broken it, and I won’t do it again. I don’t like it, but Mom enjoys playing with it. Congrats Katya on your first ever post. Hope to hear more from you. We wholeheartedly 2nd the motions! Thank you, Mr. Nikita and Miss Elvira! I’ve been holding back for too long, letting Mom do all the work. It’s time I put paw to keyboard!